I’m a fan of all the various NCIS incarnations and have been right since it was JAG. The original NCIS, with Gibbs, Abby et al is iconic – everyone knows about Gibbs Rules even if they don’t watch the show - and NCIS New Orleans is really starting to come into its own now that they’ve let the series develop under its own steam rather than shoehorning in characters from Washington the whole time. Both series have strong Navy-based plots and excellent long story arcs over the season supported by great characters. NCIS LA (and why has the series not given in and called it that, like everyone else does, instead of spelling out Los Angeles in full every time?) is a bit different however and I enjoy it a lot because of that. 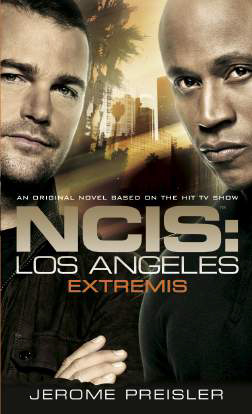 The stories, based more around Homeland Security, have always been weaker to my mind and some of the long story arcs have been inconsequential but NCIS LA is about the characters much more than the plot. The team dynamics are everything in the episodes; Callen (Chris o'Donnell) and Hanna (LL Cool J) bickering in the car like a married couple, Kensi and Deeks proving the whole “opposites attract” thing, Nell and Eric being the tech intelligence in ops and giggling like kids at being brave enough to eat biscuits in a no-food zone, all ruled over by the indomitable Hetty Lange, 4’ 9” of authority who seems to have a back story so unbelievable that it has to be true. And it’s these incidental interactions, the throwaway lines, the character vignettes between story scenes that makes the series work so well for me on TV. It’s just a real pity that this didn’t transfer well at all to the printed page. If you didn’t know the characters really well from the series you wouldn’t be able to pick them up from the descriptions in the book, which were sketchy at best. As big a fan of the show as I am, I wouldn’t have recognised the characters without their names and even then was picking up on things that could have been explained better. The interactions that work so well visually in 2 minutes are awkward, clunky and drawn out when written down, with even the usually amusing Deeks, because you can’t hear the voice and see the expressions, coming across more cringeworthy than comedic. One thing though that did hold true to the TV series was the weak plotline, which was also a pity. I could have forgiven the badly fleshed out characters if the story was a gripping page-turner which, for me, it just wasn’t. The story was a good concept for what it was but drawn out far too much to make it a snappy, exciting read without adding the necessary depth and detail needed to make a novel out of it. However, I may have missed something so, if you’re a fan of the show, give it a try and it may pull you in. If you’re not, it’s not worth it just as a generic thriller read.